Massive billboards in northern Russia depict Orthodox Christian Saints, alongside text calling on them to pray to God for the sake of passing drivers. Traffic police data shows that road deaths have been reduced by a third. When it comes to road safety, maybe all you need is a little Jesus in your life. Sixty billboards depicting Orthodox saints have recently appeared next to highways throughout St. Petersburg in northern Russia, reportedly in an effort to reduce traffic accidents. "Our holy mother, St. Xenia, pray to God for us!" Photographs of the massive billboards show that they depict religious figures including St. Alexander Nevsky and St. Nicholas, alongside text calling on the saints to “pray to God” on behalf of passersby. One of the masterminds of the project, businessman Valery Gusev, told the St. Petersburg based news outlet Fontanka.ru that the decision to run the billboards was made following the success of a similar initiative in the nearby Tver region in 2017. "Our most reverend Father, St. Sergius, pray to God for us!" “It had an effect,” he was quoted as saying on Friday, citing traffic police data that showed road deaths had been reduced by a third. Gusev told the outlet the Orthodox saints depicted in the billboards are patrons of travelers, “car enthusiasts” and healers. 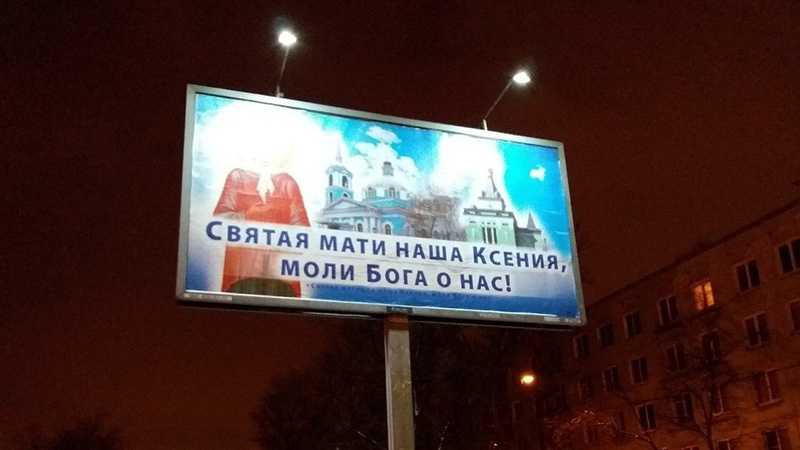 Fontanka cited the ad agency Gallery as saying that the company behind St. Petersburg’s billboards had also rented an unknown number of billboards depicting Orthodox saints in Moscow.